About the Corn Mother: Literally the spirit of the corn in Native American traditions, Corn Mother brings with her the bounty of earth, its healing capabilities, it's nurturing nature, and its providence. This is the season when Corn Mother really shines, beautiful with the harvest. She is happy to share of this bounty and give all those who seek her an appreciation of self, a healthy dose of practicality, and a measure of good common sense. Around this time of year the Seminole Indians (in the Florida area) dance the green corn dance to welcome the crop and ensure ongoing fertility in the fields and tribe. This also marks the beginning of the Seminole year. So, if you enjoy dancing, grab a partner and dance? Or, perhaps do some dance aerobics. As you do, breathe deeply and release your stress into Corn Mother's keeping. she will turn it into something positive, just as the land takes waste and makes it into beauty. Using corn in rituals and spells is perfectly fitting for this occasion. Scatter cornmeal around the sacred space to mark your magic circle, or scatter it to the wind so Corn Mother can bring fertility back to you. Keeping a dried ear of corn in the house invokes Corn Mother's protection and luck, consuming corn internalizes her blessings. Other Names: Lark's heel, Lark's toe, Lark's claw, Knight's spur, Staggerweed, Field larkspur, Rocket larkspur. Note: Larkspurs and Delphiniums are in the same flower family but they are not the same plant. According to Greek mythology, the larkspur sprang from the blood of Ajax, who committed suicide after not being given the armor of the fallen warrior Achilles. It was once used to heal wounds and on the battlefield, to kill parasites, which prey especially on those living under difficult conditions. Besides protecting warriors, larkspur is said to keep away scorpions and venemous snakes as well as more ethereal threats, such as ghosts. In Transylvania, dried larkspur was placed in stables to keep sorcerers from casting their spells upon the animals; in England, however, both dried and fresh larkspurs were used in protection spells, to cure ailments, and as integral ingredients in Summer Solstice celebrations. Add to bathwater for protection. Sprinkle around a place or person who seems to be possessed, as larkspur frightens away ghosts and devils. Also, if you look at Midsummer's bonfires through larkspur flowers, it is said to strengthen the eyesight. According to one myth of a Native American tribe, this flower came into being by a curious celestial figure who ripped open the evening sky, scooped up and twisted a portion of it and created a spike. When she plunged it down to earth so as to climb down and satiate her curiosity, small blue flecks of sky adhered to it. Eventually the sun dried out the stalk, and scattered small pieces along the planet, thus creating the delicate larkspur flower. 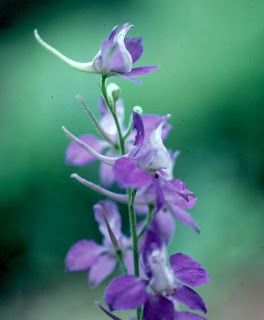 The flower is also associated with the Virgin Mary's sorrows, larkspur represents Mary's tears. In the language of plants, each color of the larkspur flower has its own separate meaning. Pink generally represents fickleness, white signifies a happy-go-lucky nature, while purple is often indicative of first love and a sweet disposition. In general, though, the message these flowers represent is an open heart, and they are sometimes associated with strong romantic bonds, which is why many people give these flowers as unique gifts to both old and new lovers. Although most people give larkspurs in the form of a bouquet – usually with contrasting flowers that hold a similar message – some prefer to give a single stalk, so as to convey a clear message of a strong emotional attachment to the recipient.